The fight is on! Battlebond has given us a spectacular new commander, Najeela, the Blade-Blossom. At long last, we have a leader for a Warrior tribal EDH deck! Though Najeela herself is mono-red, her activated ability contains all five color symbols, giving her a rainbow-tastic color identity. This isn’t the first time we’ve seen a tribal commander with a five-color activated ability. Back in Oath of the Gatewatch, General Tazri gave us all a place to put our Ally creature cards. 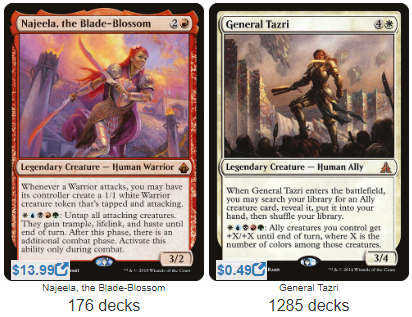 With 1,285 decks to her name, General Tazri has certainly proven herself popular. Najeela presently only has 176 decks below her belt, but thus far she’s the #1 most popular commander from Battlebond, so she’s sure to be hot on Tazri’s heels. Both commanders provide a home for a specific tribe, each with a triggered ability to recruit an army and an activated ability to bolster their troops. So how do these commanders differ? 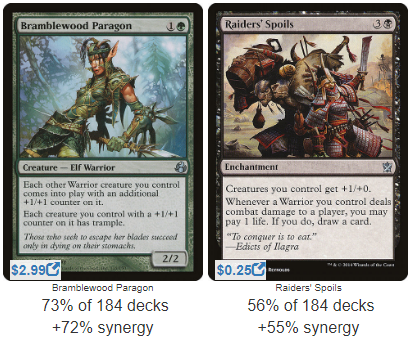 How do the five-color Warriors compare to the five-color Allies? Let’s find out! Let us begin with General Tazri. When Tazri enters the battlefield, she’ll search your library for an Ally, the famous creature type from the plane of Zendikar. In their battle against the colorless Eldrazi, creatures of all colors united to protect their homeland, which gives Tazri a myriad of possible targets. Tazri also sports an activated ability that allows her to pump up her team. At maximum capacity, her ability lets you pay five mana to give your board +5/+5 until end of turn. Not a bad way to close out a game. Much like Tazri herself, many Allies have enters-the-battlefield effects, and much like Slivers, they become significantly more powerful as they grow in number. 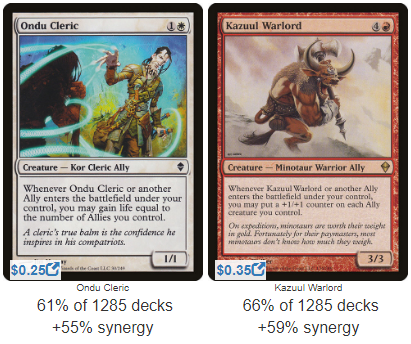 Ondu Cleric, for example, provides you with extra life for each Ally you control. Kazuul Warlord buffs your whole team as new members join the ranks. While Slivers specialize in static characteristics that make them all the same (for example, Winged Sliver’s flying or Might Sliver’s +2/+2), Allies flourish by cultivating each other’s uniqueness. Gemhide Sliver is a different beast entirely from Harabaz Druid. The most significant aspect of Ally creatures is that their unique abilities don’t merely trigger when they themselves enter the battlefield. The Rally keyword (as seen on cards like Resolute Blademaster) states that their abilities trigger whenever they or another Ally enters the fray. This might seem innocuous if you haven’t played against an Ally deck before, but in practice, it’s devastating. Let’s look over an Average General Tazri deck for greater detail. I’ll be truthful, when a buddy of mine first threw together an Ally deck, I didn’t expect much. 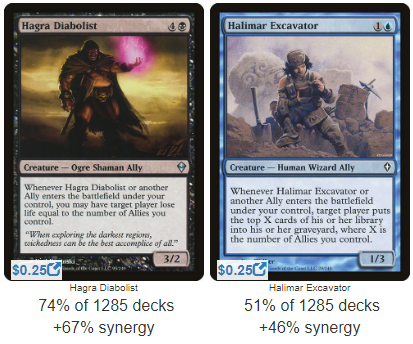 I was always a thoroughly non-tribal player, and I thought that simple effects like Halimar Excavator wouldn’t amount to much in a Commander game. First, I had severely underestimated each Ally’s ability. A single Hagra Diabolist doesn’t look like much on its own, but that’s exactly the point: it’s not played on its own. It brought friends. At first you might only lose one life, but one soon becomes two, which soon becomes five, which soon becomes ten. Before you know it, you have three life and you’ll die if Tazri plays literally any creature in their deck. In a similar vein, Halimar Excavator absolutely shook me. I didn’t think a little blue creature would wreak as much havoc as it did. Milling wasn’t the goal of the deck, so Halimar struck me as a totally unnecessary inclusion. Turns out, it’s a win condition, and a darn good one. If left alone, Allies don’t just snowball, they form an avalanche. Second, I hadn’t taken stock of just how many triggers Allies will get throughout the course of the game. From Retreat to Emeria to Unified Front, there are a surprising number of ways to trigger your team multiple times in the same turn. In fact, many of the best cards that give you multiple ETB triggers don’t even say the word ‘Ally’ on them. 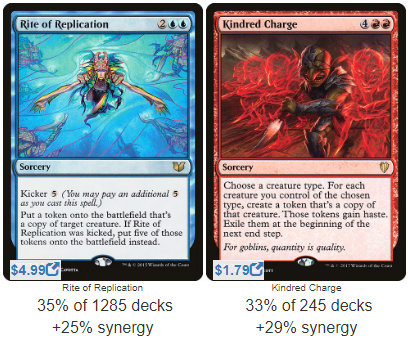 We all know Rite of Replication is a powerful card, but nowhere have I seen it more effective than in an Ally deck. This spell takes Allies from zero to sixty in no time flat. We’ve probably all seen a Rite of Replication target a Gray Merchant of Asphodel before. Each Gray Merchant triggers, and they count the number of black symbols on your side of the field, including each other, because they all entered play at the same time. Assuming you control only the Gray Merchant when you cast Replication, you’ll drain everyone for sixty life, twelve from each new copy. That’s impressive, and often game-ending. However, Allies turn that up a notch. Why? Because they don’t just trigger when they enter the battlefield, they also trigger when they see each other. Gray Merchant counts your other copies, but each of them only triggers one time. Allies count the other copies and trigger for each of them. Take Halimar Excavator. Assuming that’s your only Ally when you cast the Replication, you’ll wind up with six total Allies. Your original Excavator will mill six cards five times, for a total of thirty. Your next copy will do the same. And so will the next. And the next. By casting one spell on a measly 1/3, you’ll wind up milling a total of 180 cards around the board. That’s just using it on one lonely Halimar Excavator. Imagine using it on Hagra Diabolist or Kalastria Healer. An alarming number of your creatures are as deadly as Gray Merchant of Asphodel. What’s more, you’re not merely putting all your eggs into one basket with Rite of Replication. You also have Kindred Charge and Kindred Summons, doubling your army and repeating dozens of effects in the process. While some decks use Ghostway and Eerie Interlude as protection against a potential Wrath of God, here these spells are potentially game-ending with the amount of additional value they can provide. There’s one more piece to Tazri’s puzzle, and it’s the most important one of all. 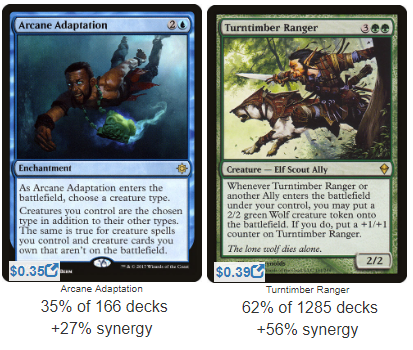 If you’re unfamiliar with competitive Commander circles, you may be surprised, as I was, to discover that Tazri is one of the ‘Tier 1’ commanders. As it turns out, her combo potential is off the charts. Let’s start with a truly dastardly Conspiracy. Not the set Conspiracy, the enchantment. It and two others, Arcane Adaptation and Xenograft, have the power to change the creature types of each creature you control. If your deck is already full of Allies, why should you need to change any creature types? Because of Turntimber Ranger. Whenever an Ally enters the field, Justin Turntimberlake will make you a Wolf token. However, that Wolf is an Ally, so Turntimber triggers again to give you another Wolf… which is an Ally… which makes another Wolf… and so on. This ability goes infinite right away, triggering your Halimar Excavators and Ondu Clerics instantly. Luckily, Turntimber Ranger’s trigger is also optional, so you can stop at any time. If it wasn’t a ‘may’ ability, you’d get stuck in an unending loop and the game would end in a draw. It’s always important to be able to control your infinite combos. We’re not done yet. 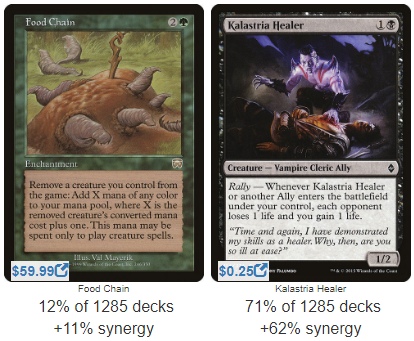 Food Chain, master of a million combos, rears its head in Tazri’s deck as well. You may have noticed Squee, the Immortal in the Average Tazri Decklist above. Squee isn’t an Ally creature, yet he still shows as extra-popular in new Tazri decks. If you’re looking for a reason, that reason is Food Chain. Squee, like Misthollow Griffin and Eternal Scourge before him, can be cast from exile. Food Chain can therefore be used to cast and recast these creatures an infinite number of times, gaining mana with each loop. That mana is then used to cast Tazri, who can fetch you Kalastria Healer. Since you have infinite mana, you can exile and recast Tazri as many times as you like, with the Healer happily draining your opponents away. That detail in particular is what makes Tazri so powerful: she can fetch you any Ally. You don’t just have a tribal leader in your Command Zone, you have a Worldly Tutor, so your deck has unparalleled consistency. What I first surmised would be a simple, dorky tribal deck turned out to be a monstrous powerhouse. With Tazri in the fray, it’s no wonder the Eldrazi lost on Zendikar. Enough about Allies, let’s now move onto a long-neglected tribe: Warriors. Najeela, the Blade-Blossom has opened the doors for a creature type that hasn’t ever gotten much love. Famous tribes like Elves and Zombies have numerous synergies within their ranks, from Elvish Archdruid and Priest of Titania to Vengeful Dead and the newly-reprinted Death Baron. What tribal lords do Warriors have to offer us? On the whole, though, Warriors are a scattered tribe, owing primarily to their status as a ‘class’ than a specific race, such as Dwarf or Goblin. Like Soldiers or Knights, many creatures are merely incidentally Warriors, rather than being dedicated to the subtype. However, we’re getting ahead of ourselves. While Warriors may have a scattered populace, Najeela herself doesn’t need to be doted upon. Her abilities pack a huge punch. Whenever she or another Warrior attacks, you make a 1/1 token that’s also attacking. That’s right, every time you initiate an attack with your creatures – including those tokens Najeela makes – you’ll double your army. If left to its own devices, that army increases exponentially, which is frankly terrifying. It’s reminiscent of Brimaz, King of Oreskos, only much better. Not only that, but Najeela touts a very impressive activated ability. While Tazri’s ability is simply extra gravy, Najeela’s is potentially devastating. For one mana of each color, Najeela pumps her creatures with impressive stats, but more importantly, she gives you an additional combat phase. This is Aggravated Assault in the Command Zone, and it’s beautiful. If you’re familiar with decks like Neheb, the Eternal, you already know the shenanigans we can get into. Combat begets mana, and mana begets mana. All Najeela needs is a Druids’ Repository and you’re in business. Every creature you or a Bear Umbra or possibly even a Sword of Feast and Famine and you’re in business. So, bearing all of this in mind, let’s take a look at a potential Najeela brew. There’s some excellent stuff here, but what I’m struck most by is the sheer power of ‘generic’ tribal cards that can fit into any deck. Door of Destinies, for example, can go anywhere, but in this deck, I really feel its power. Coat of Arms can go from giving your team +3/+3 to +7+7 just by dint of attacking. Kindred Discovery draws you a distressing number of cards. When your commander gives you free creatures, the value just lines right up for you. I’ll mention just a few of my favorite cards before we leave today. As I mentioned earlier, many creatures simply happen to be Warriors, but are perfectly powerful on their own without any specifically Warrior-related synergy. 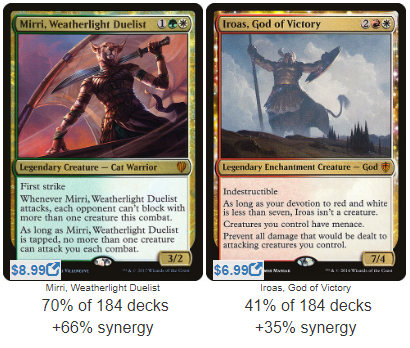 That doesn’t mean the synergy isn’t there, though; Mirri, Weatherlight Duelist is excellent in this deck. She doesn’t mention Warriors in her rules text, but she’s still much better than, for example, Boldwyr Intimidator, which does mention Warriors, but is truthfully just too expensive for a middling ability. Mirri slots neatly into the deck, not because of the tribal elements, but the combative ones too. This isn’t just a tribal deck, it’s also an aggressive deck. Our commander literally begs us to attack as much as possible, so along with Mirri, we have things like Dolmen Gate and Iroas, God of Victory to keep those creature tokens alive, so they can create even more tokens next turn. Tazri is a splendid commander who can turn the dials all the way up to 100 if she wants to go crazy. As a casual deck, she revels in the ever-increasing uniquenesses of each of her creatures, and as a competitive deck, she’s a tutor who will rush out some crazy combos. Najeela, on the other hand, demonstrates powers almost completely independent from the Warrior classification. Usually, tribal decks take otherwise lackluster cards and improve them with the support of other members within that tribe, but Najeela’s Warriors proved their mettle and are good enough on their own. Plus, she can attack you ad infinitum if you’re not careful. What’s not to love? Before I go, I’ve got just a few suggestions for cards these commanders could consider playing more often. Fellwar Stone: I do not understand Magic players sometimes. Maybe that sounds harsh, but come on! This doesn’t belong in 14% of Tazri decks, it belongs in 100% of them! 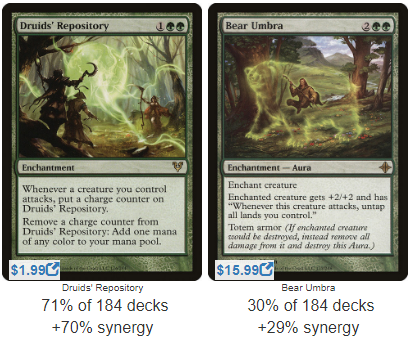 Any five-color deck is desperate for mana fixing this powerful at such a low mana cost. 22% of players are currently running Pillar of Origins. That’s 8% more than Fellwar Stone, and that’s absurd. I’m normally very affable about playing the cards you love, but Pillar of Origins is absolute trash, and you should replace it with Fellwar Stone immediately. Painful Truths: Every time I see this card, it impresses me more and more. 3 mana for 3 cards is a great rate. Blade of Selves: This is another excellent way to re-trigger our Allies multiple times. This is the tiny metal version of Rite of Replication. Patriarch’s Bidding: This card can be dangerous in a meta with other tribal decks, because it can allow your opponents to benefit from your spell. Still, I doubt any of them will have even half the number of enters-the-battlefield triggers you’d get from resurrecting so many Allies at once. Bruse Tarl, Boorish Herder: Oh yeah. He’s not just a Partner commander, he’s an Ally too. Sosuke, Son of Seshiro: It’s absolutely criminal that this only shows up in 21% of Najeela decks thus far. Ignore the line about the Snakes, that second ability is killer! Eldrazi Monument: Our commander makes free creatures every turn. It’s worth it to give one of them up for this much power. Mirror Entity: I know, this is kinda cheating because it’s a Changeling creature, but Mirror Entity has won me games. Those 1/1s don’t have to stay 1/1s. Radiant Destiny: The more I play this game, the more I realize that vigilance is one of white’s best multiplayer abilities. The ability to attack and simultaneously defend yourself against several other players shouldn’t be underestimated. Archetype of Aggression: I don’t like Surrak Dragonclaw. He’s a bit pricey for this effect. I’d rather pay three mana and steal the trample from my opponents. This way, all Najeela’s 1/1s are good chump blockers no matter what they encounter. So, which of these commanders do you prefer? Has Tazri rallied you to her cause, or are you eager to jump into the arena with Najeela? Oh, and which match-up would you like to see on the next Commander Showdown? Arcades, the Strategist vs Doran, the Siege Tower: They say the best offense is a good defense. Who does it better? Wasitora, Nekoru Queen vs Vaevictus Asmadi, the Dire: Jund’em out with two commanders with crazy combat triggers! Pir, Imaginative Rascal + Toothy, Imaginary Friend vs Vorel of the Hull Clade: So many extra counters it’ll make your head spin. Ezuri, Renegade Leader vs Marwyn, the Nurturer: Elves have been Warriors and Allies, and they’re also their own amazing tribe! How do their potential leaders differ in strategy?